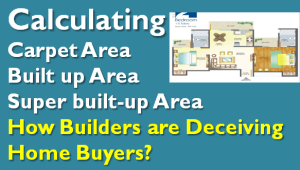 How builders use super built-up area to deceive home buyers? The slow down in Real Estate has made the Builder’s innovative and they have found newer ways to deceive home buyers. Carpet Area – This is the total floor area of the flat. Built-up Area – This is carpet area + the area occupied by the walls. Super Built-up Area – This is built-up area and proportionate share of common areas. But unfortunately there is no standard definition what constitutes the common area. It depends on the builder and most of the time buyers have no way to verify the same. The common area may include the lobby, staircase, elevator and the corridor outside the apartment. Some may even include the terrace, security room, electrical room and/or pump room. I have also seen instances of parking space getting included in super built-up area. the carpet area, then you have a huge living space. If it is built-up area, then you have lesser space. If it is super-built up area, then you compromise heavily on the living area. In fact, the actual carpet area may just be around 600 sq ft in comparison to the total flat area of 1,000 sq ft.
Also Read: How Wrong Maths is used to Fool Investors! How to calculate built-up area? Its easy! Remember the basic geometry and calculation of area of rectangle. Built up area including balcony is 678 sq ft, which is 68% of super built-up area. 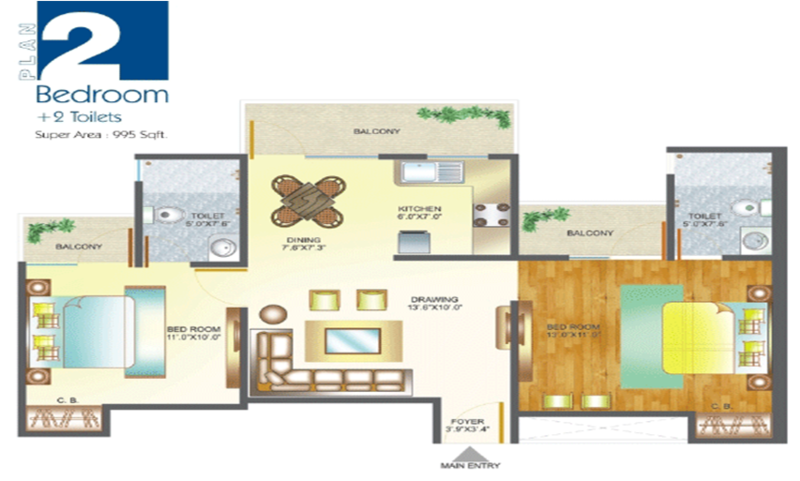 Built up area excluding balcony is 576 sq ft, which is 58% of super built-up area. So if you bought the flat for Rs 30 lakhs which is around Rs 3,000 per square foot (as per super built up area). The real price is Rs 4,400 per square foot based on built-up area! This is 150% of the original price. As this is new trend started by builders you generally have a higher percentage of built-up area (around 80 percent) of the total area in older flats. When comparing quotes, compare built-up area to built-up area, not built-up area to super built-up area. Builders are using the increase in super built-up area at the time of possession to unethically get money from customers or offset the delayed penalty for late possession! What may appear cheaper may not be on actually cheaper. So as an alert buyer always compare the built up area of projects and calculate your cost on the same. The website is Awesome, really helped me a lot on Tax saving and other aspects of financial planning.